We’ve seen our fair share of Dr. Who gizmos in the past, with the TARDIS as well as Dalek being two of the more popular icons to be turned into merchandise. Well, today the TARDIS takes centerstage yet again, where this $34.99 purchase will actually float in mid air as though it was surrounded by some sort of mystical power. Well, no magic is involved here but pure science – after all, the Levitating TARDIS relies on the magic of magnets in order to ensure the blue police box hovers within the black base unit without falling victim to the laws of gravity. 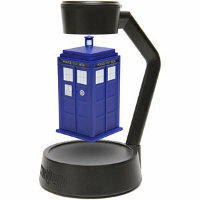 With some practice and deftness of fingers, you can easily flick the TARDIS to set it spinning. It isn’t too environmentally friendly though, requiring half a dozen AA batteries to run – best to get rechargeables to go along with this.